We’ve had more than a few of those calls recently with clients (and a few with relatives and friends too!). Of course, we never know what will happen in the future. But we do know that while some market declines foreshadow future problems, we also know that many market declines mean absolutely nothing. That’s just what markets do. Those red dots show you how much the market declined at some point during the year. The grey bars show you where the market actually closed at the end of each year. What a great chart, right? 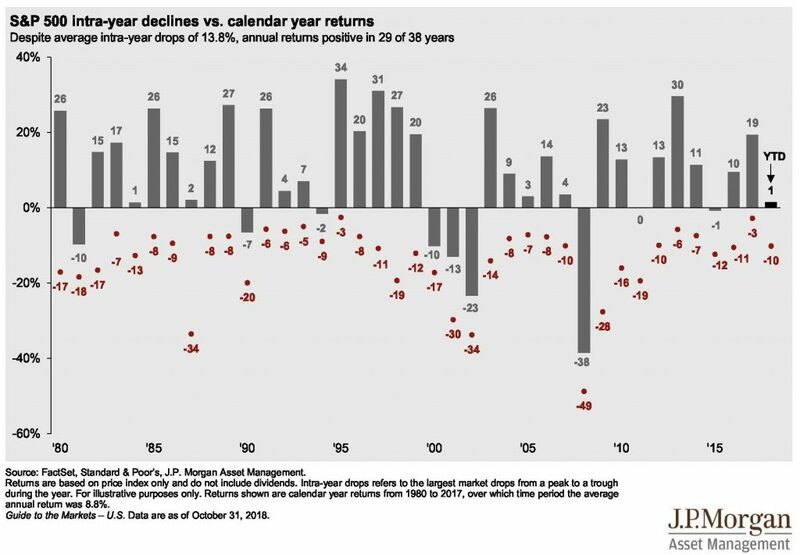 It shows us that market declines happen each and every year. In fact, the average mid-year drop is about 14%, which is pretty scary. Yet, the market closes with positive results in 29 out of 38 years measured. Pullbacks are normal. We expect a 10% drop once per year on average, even in the middle of an otherwise healthy market. Pullbacks don’t always “mean” anything or foretell further declines. Even if it is meaningful decline, the best course of action is to stick with your allocation. It was custom designed for you, with the goal of getting you the long-term returns you need to reach your financial goals.